Sustainable Measures for Advanced Research and Training S.M.A.R.T. Young Europeans, open your eyes! Young United by the League! 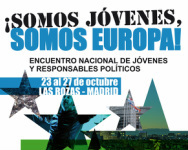 Did you know that Adefis Juventud Internacional is an EVS spot? Write us, If you want to be a volunteer abroad. Don't miss this unique experience!